That is what happened 25 years ago this Sunday, when New Zealand became the first country to set a formal target for how much prices should rise each year — zero to 2 percent in its initial action. The practice was so successful in making the high inflation of the 1970s and ’80s a thing of the past that all of the world’s most advanced nations have emulated it in one form or another. A 2 percent inflation target is now the norm across much of the world, having become virtually an economic religion. Starting in the late 1990s, Japan found itself stuck in a pattern of falling prices, or deflation, even after it cut interest rates all the way to zero. The United States suffered a mild recession in 2001, and the Fed cut interest rates to 1 percent to help spur a recovery. Then came the global financial crisis of 2007 to 2009, spurring a steep downturn across the planet and causing central banks to slash interest rates. All of this has quite a few smart economists wondering whether the central bankers got the target number wrong. If they had set it a bit higher, perhaps at 3 or 4 percent, they might have been better able to combat the Great Recession because they could cut inflation-adjusted interest rates by more. 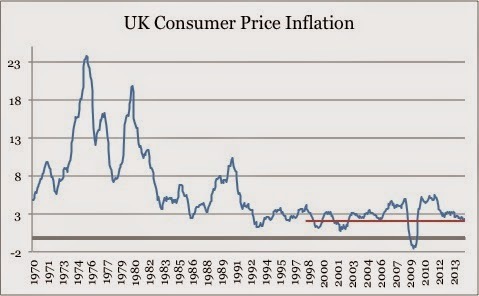 While the UK generally has had low and (relatively) stable inflation since the early 1990s, it did miss its target considerably in 2007-2012, and it may be in danger of undershooting its target (as the Fed is) - inflation in November was 1% (this is not evident in the chart because it plots the percentage change in the price index from the year before). Although I think the Bank of England deserves credit for not tightening in the face of inflation which ultimately proved transitory, this does call the inflation targeting framework into question. Arguably, it may have helped keep inflation expectations "anchored" even as inflation deviated from target. However, at some point, one would expect such deviations to undermine the credibility of the regime, and it was the idea of establishing credibility that made it attractive to academic economists in the first place (the underlying intuition for this was nicely described in this speech by Philadelphia Fed President Charles Plosser). The other question, of whether a higher target, or a different one - such as a target price level (inflation is the rate of change of the price level) or nominal GDP - would be better is an interesting and important one. The difficulty now is that, having established a monetary policy rule, the credibility of any new rule could be diminished by a change in rules. A group of economics students in the UK have undertaken a movement to reform the economics curriculum. I'm a little surprised that I haven't run into similar sentiments at Wesleyan - I can't decide if I'm disappointed or relieved by this. The criticisms seem to me to be based on a somewhat unfair caricature of economics and economists, that we're head-in-the-sand apologists for "neoliberalism" who use mathematics as a form of obscurantism and have little useful to say about the "real world," particularly in the wake of the financial crisis. Some of this may be rooted in the fact that the "economics" articulated by politicians, government officials and the press - what Simon Wren-Lewis has called "mediamacro" - does not reflect the views of most of mainstream academic economics. In particular the obsession with government budget deficits is not based on textbook economics (I discussed an example of this misconception in a European context a couple of years ago). The gains from exchange and specialization possible from voluntary trade (i.e., Adam Smith's "Invisible Hand"), and the ability of markets make to adjustments based to dispersed information about what Hayek called "the particular circumstances of time and place" which would be un-knowable to any central planner. While economists need to make our students aware of the hidden and under-appreciated role markets play in organizing society and in lifting humanity out of subsistence-level poverty, we also devote a considerable amount of attention to how they fail. In particular, problems of monopoly power, externalities, public goods and asymmetric information are standard subjects for introductory economics courses. (2a., There are also reasons to be skeptical in practice of the ability of our political system to effectively correct market failures). We do suffer from an excess of libertarians who mistakenly believe that economic theory validates their views - I usually think of these people as students who stopped listening after they learned about point #1 in first several weeks of their principles courses (or put too much weight on #2a). But these folks are a minority in economics, though perhaps a vocal enough one that students and other outsiders might believe they are more representative than they really are. We typically introduce markets with the model of "supply and demand," and the exercise of thinking in terms of models provides much of the lasting value of studying economics. Working with economic models can sharpen students' logical and critical thinking skills immensely. As John Cochrane nicely put it recently, "economic models are quantitative parables, not explicit and complete descriptions of reality." The criticism that models are "simplifications" is a cheap one - writing down a set of assumptions in mathematical form and working out the implications (and then testing them against data), is where the insight comes from. The discipline of doing this cultivates an ability to think intelligently about tradeoffs and hidden costs, and to trace conclusions back to underlying assumptions and consider how changing assumptions lead to different conclusions. Since models are, by necessity, very stylized descriptions of the world, students of economics must not only learn how to work with them, but also how to judge which simplifications are appropriate for a given circumstance or question. As Keynes said, "Economics is the science of thinking in terms of models joined to the art of choosing models which are relevant to the contemporary world." So I think the core of what we try to do in our introductory economics courses - introducing markets (both their successes and failures), and teaching students how to think in terms of models - is extremely worthwhile. Of course, this does not cover everything that we possibly would like to do in a course (or in small set of courses). Much of economics is concerned with the allocation of scarce resources, and the time that our students can spend on a course in a semester (both in and out of the classroom) is very limited, forcing some difficult choices on instructors. Some of the criticisms made by the UK students seem to be about what we're leaving out, though I think what we're doing in our introductory courses is pretty important, and laying some groundwork in the economic way of thinking will help the students tackle issues like understanding the financial crisis, either in later classes or independently. While many of the debates in the news are about macroeconomic policy (and as a macroeconomist, I'm happy to see the revival of interest in the topic, even if arises from unfortunate sources), the core microeconomic concepts are very important and not to be skipped. While it can be exciting to be teaching a subject that is relevant to contemporary events, we should not be seduced into bringing "news" into the classroom in a way that interferes with developing an understanding of the fundamentals. There is sometimes a bit of a muddle in these navel-gazing discussions, too, between what should be in our undergraduate curriculum and the separate, but not wholly unrelated, issue of our research agenda and graduate curriculum. I'm not entirely unsympathetic to the calls for "methodological pluralism" though I wouldn't go as far as the UK students would like. I have argued for graduate study of the history of economic thought, and I have emphasized it in my undergraduate teaching, using it as an organizing principle for my intermediate macroeconomics class (and also making my intro students read some Smith, Hayek, Friedman and Keynes). As a field, I do think macroeconomics is at a point where we should be open to reconsiderations of some of the standard tools (though I don't think that is ever not the case), and I worry that the "publish or perish" incentives we all face mean that we do too little of that. Karl Whelan of University College, Dublin has a written nice essay "Teaching Economics 'After the Crash'" with a more detailed response to the UK students' criticisms which is well worth reading.